SwiftPOS Back Office POS Management software is designed to manage single or multiple venues with a diverse range of security requirements for remote access. Using broadband networks you can centralise your data management systems with secure remote access to selected information via Web Reports or on-line access to the Head Office database. 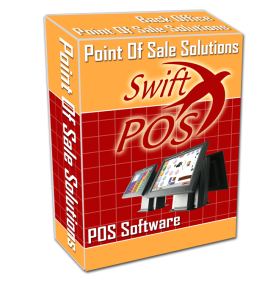 The SwiftPOS suite of Software Modules manages the back office functions and links the Point of Sale Terminals together to create a total POS solution. The Software provides comprehensive management of inventory, clerks, accounts, membership, loyalty and financial control of the venue. With integration to security cameras, it can help detect problems such as theft and wastage before they get out of hand. You know exactly what your Inventory-on-hand is, up until the last sale, with the real time processing of sales transactions. The SwiftPOS suite of software has been written using the latest Microsoft .NET development environment for ease of deployment and uses the Microsoft SQL Server platform for maximum reliability and performance. There is no limit to the amount of data intelligence that can be stored in your SQL database for future analysis. Accessing your data via the Internet or a private network feels just as fast as if you were in the same office as the main SQL Data Server. Using the features available in the SwiftPOS Accounts, Membership & Loyalty software that are fully integrated with the POS Terminals, there is no double handling of transactions with account balances and customer’s loyalty points available across all Venues. Loyalty programs can be done with a minimum amount of effort and can return excellent results. While the SwiftPOS Terminals will run standalone with no central point of failure, advanced features which draw information from the Host PC can be utilised with all the benefits of an on-line POS system. These include integration with SwiftPOS Global Loyalty systems, Poker Machine loyalty and Property Management systems that are provided by the SwiftPOS suite of products. Designed to manage multiple Venues connected via the Internet or a Virtual Private Network. Multiple price levels available over multiple venues with easy price management. Real time updating of all sales reports for instant business analysis. User names and passwords to secure access to location specific sensitive information. Easy to change prices and update all POS Terminals automatically within a few seconds. Data entry is made quick and easy with well organised screens. Continual development and innovation of new features to cater for an ever changing & growing market. Quality reference manual and on-line help. Print all reports to disk in Microsoft Word, Excel, Adobe Acrobat or XML format saves paper and provides permanent records. Create your own Custom Reports in Microsoft Report Writer. Weekly specials with automatic price changes. Happy Hour pricing options for any day of the week and any time for selected products. Price Label Designer & Retail Price Management. Hourly sales with average sale per customer and customer count report to assist with staffing levels in different locations. Monitor inventory levels and reduce overstocking, shrinkage and theft. Increase stock turnover and reduce overstocking. Run Debit/Credit Accounts with credit limits at the Point of Sale over many Venues. Run real-time Global Loyalty with redemption limits at the Point of Sale over many Venues. Runs on Windows XP, VISTA, Windows 7 and 2003/2008 Server Networks with Microsoft SQL Server 2005 or Microsoft SQL Server 2008. 32bit and 64bit Operating Systems are fully supported. With a team of industry professionals that have over 30 years in Hospitality POS Software development and feedback from over 5,000 customers worldwide the software has matured to an extremely powerful, reliable, world class application that is easy to use and maintain. The latest release has simplified software menu designs to reduce errors and increase overall staff productivity. You can quickly train a new manager or new operator to get the most out of the software. The SQL database has been designed to be totally transaction based so that you can produce reports between any date ranges that reveal products sold, costs or inventory used in either detailed or summary format. Although SwiftPOS has an extensive range of reports, there may be times when you want to use the data in a spread sheet format to gain other business intelligence. Simply link to Excel and you can work with the data, create custom graphs and print the spread sheet.